We offer competitive prices for quality products. All purchases are covered by dealer and manufacturer warranty services. Looking for an alternative to replace your broken glass in your patio table? Our acrylic and fiberglass table tops in Faux Stone and Slate (smooth finish). Our acrylic table tops are durable and easy to install..
We offer the best products to clean your outdoor patio furniture and patio furniture cushions. Casual Clean is the best product we have found to clean vinyl strapping on you patio chairs and chaises. Casual clean also works well on PVC plastic stack chairs commonly purchased. Our classic universal outdoor furniture cushions will add comfort and classic elegance to outdoor patio chairs and chaises. Our outdoor cushions are designed to fit a variety of patio furniture styles including vinyl strap chairs and chaises as well as aluminum patio furniture. True patio furniture, like ours, is designed to make you comfortable and last for years giving you true value for your money. We're proud of our patio furniture and authorized manufacturers. We offer the best, whether it is the finest in adirondack chairs, love seats, armchairs, or umbrellas. 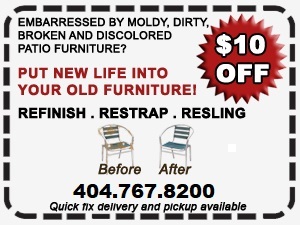 Bennett Restrapping.com is your online source for patio furniture parts. Replacing the worn patio chair glides, end caps, common wear parts and patio chair feet on your outdoor patio furniture is an inexpensive investment. With a few simple measurements we can create a replacement sling for virtually any outdoor patio sling furniture manufacturer. No original part numbers required. Cost for the new replacement sling includes fabric cut and sewn to your measurements and new plastic sling rods. Our custom matched powder coatings offer the ability to paint the frames of metal outdoor furniture to match or blend with our vinyl and fabrics. The powder is TGIC polyester and is formulated for outdoor use. Precut vinyl replacement straps makes vinyl strap replacement quick and easy. We precut the vinyl strap to the correct length eliminating a time consuming step in process. Provide us with the hole-to-hole measurement and we'll cut your vinyl strap to the correct length. "The people were terrific; communication was the best I have experienced with a trade group. The work was first rate as well. Would HIGHLY recommend this company." "The chaise lounge chair is absolutely beautiful. We are thrilled with the results! Thanks so much for all the work you did." "Excellent service in every area; very courteous, professional and conscientious young man. I love the reconditioned work on my chair! I would recommend Dr. Patio to anyone looking to renew their patio furniture." Copyright © Bennettrestrapping.com :: 2009-2012 | All Rights Reserved.